Originally published by AFA. Translated by b9AcE. This year, 2018, Anti-Fascist Action celebrates 25 years as a network. It is with mixed feelings we observe this anniversary. 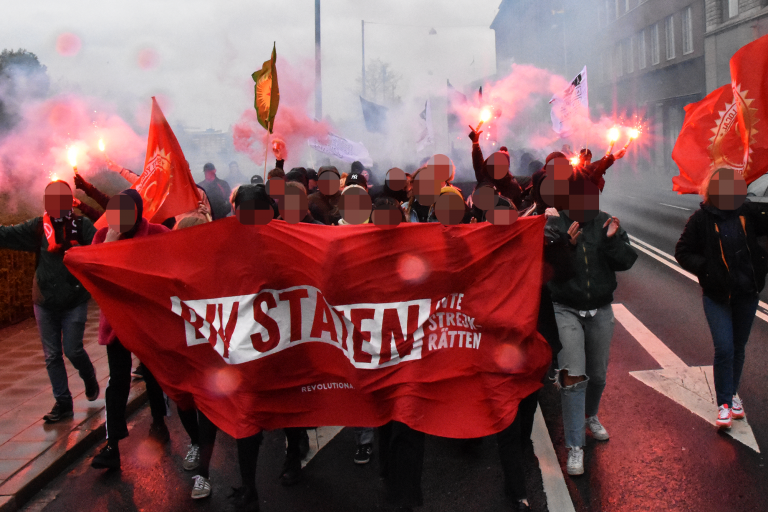 Image: Autonomous Revolutionary Nordic Alliance’s bloc in the May Day demo. The Swedish AFA-network was born from a need of organized resistance. We knew then already that to be able to do anything about Nazi violence, we had to gather the many small and create something larger. AFA was formed by youth which was forced to grow up too quickly and take the responsibility that society was avoiding – in those locations that Nazis acted freely it simply became up to organized youth to fight back. 25 years after AFA’s founding we as a movement face similar, but different, problems as then. Our Anti-Fascist predecessors fought against Sweden Democrats on the streets and in the squares – today we see the entire political establishment adapt to Sweden Democrat politics. Already 20 years ago we saw a terror-inclined White Supremacist-movement – today their heirs commit both political attacks as well as arsons and bombings. And while we – as a movement and individuals – are subject to Fascist violence, the establishment talks of the necessity of holding a dialog with the Fascists. Nazis are treated by the police as an expression of opinion among others, and we that act against them become an extremism among others. But we refuse to be spectators while Fascism is normalized into a part of the political system. Anti-Fascism is always self-defense – but Anti-Fascism also means attack! We refuse to wait to become the Fascists’ next victim! Image: Banner carried by Everything for Everyone Malmö in commemoration of Firaz Kardo, a Socialist and Malmö-resident that fell as a soldier in YPG, in the struggle against IS in Syria.